After hauling out the white wicker desk and chair from Casey's room yesterday, she decided it was time to clean up (Hallelujah! Will wonders never cease?) and rearrange her room. 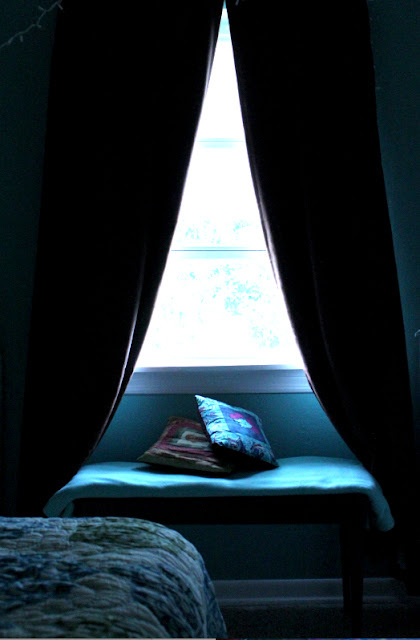 We ended up bringing the piano bench in from my room, and we placed it under her window, using her blue blanket as a seat cushion, which created a sweet little window seat for her. Her window has one of my favorite views in the house. So we decided to highlight it. Maybe it will get her to open the curtains more often. Ever since we had a break-in (a day when the curtains happened to get left open while I was gone to the store), she has left them closed continually. 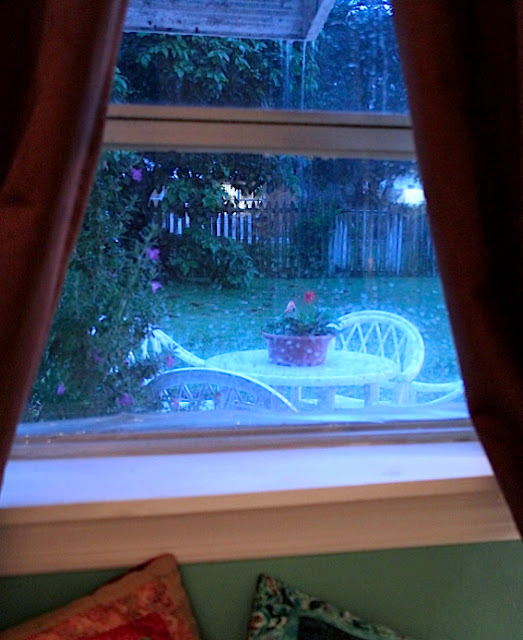 Last night, after we reworked Casey's room, and while she was at work, the rains came. They didn't let up for so long that I began to feel like it had been raining forever and was going to continue on into eternity. All well and good if you haven't been planning a garage sale in the morning. I began to let rainy thoughts hang over my head as I contemplated all the trouble the rain would hold for our morning plans. After an hour and a half or so, (going on 40 days and 40 nights in my mind) I decided to get up and go have a look at it. After all, I couldn't change it, so why not go enjoy it? There was a wonder playing out, out there beyond the windows where I've been known to stand and admire the sweet joys of my backyard view. Why miss such wonder when it's right there in full view through the windowpane? Through rain-spattered glass, falling streams of water and ensuing darkness, the backyard and patio took on a dreamy quality. ...and as my eye and the camera lens honed in on the window rather than the world outside... the scene transformed into a watercolor world. ...the patio and yard took on an artistic ambiance. The ladder was stoically accepting a rainwash, which left it with a glossy, drippy finish. Beads of water reflected in the patio lights created opaque droplets that reminded me of a mobile made of capiz shells. The world was awash in the blur of quickly falling rain, and the flowers across the way were undaunted by the darkness or the storm. There was an equally intriguing sight to behold at the kitchen window. Yellow orchid blooms were on display under the lights, playing it up for all it was worth, wearing well the sparkling gems of glittering evening raindrops. As one drop gave way to the next, the liquid beads of light kept my eyes dancing. Today, an overcast sky accented the harvest of color which all that rain has etched into my garden goodies. I can't get over these dahlias! Their vibrant color and beautiful blooms are a big 'wow!' that's accenting the back patio with Summer color galore. Thankfully, our garage sale ended up rain-free (despite my worries and the weather man's overzealous forecast) and went off without a hitch. I didn't get rich (thanks for the well wishes though, Karen) but we had fun (and donuts!). Despite the fact that the big stuff didn't sell, I made close to 60 bucks and cleared out a lot of little junk. Woo hoo! That's $60 I didn't have yesterday. I'll take it. So let it rain...because the garage sale is over, and rain now means green grass and pretty blooms later... and maybe a few more gazing moments whereby God wow's me with the ever-amazing world he created. 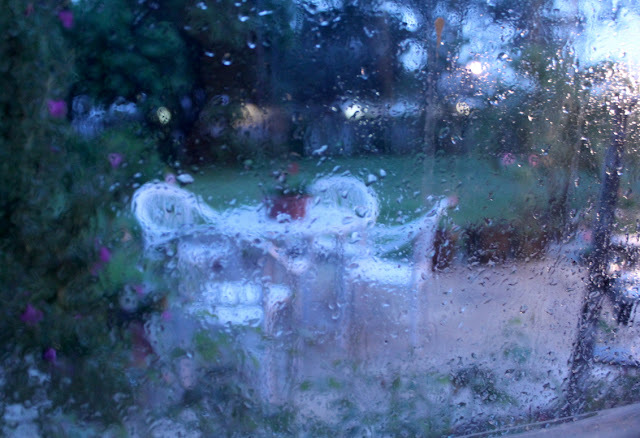 A world that sometimes comes framed by an everyday watery window. The rain photos are so beautiful! Wow, you should be a writer. Your words are amazing. And living in Phoenix and having an "arizona landscape" (rocks) I am totally jealous of that yard and view. Very, very pretty. Don't you love it when something wonderful happens just by accident? 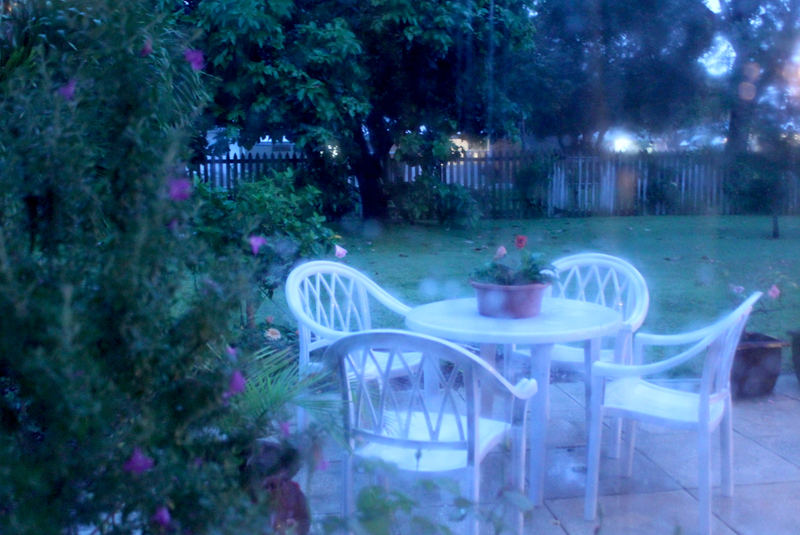 Your rain provided the perfect setting for a little experiment with your photography and the results are beautiful. Love those pretty dahlias, I'm sure they were happy to have the rain. 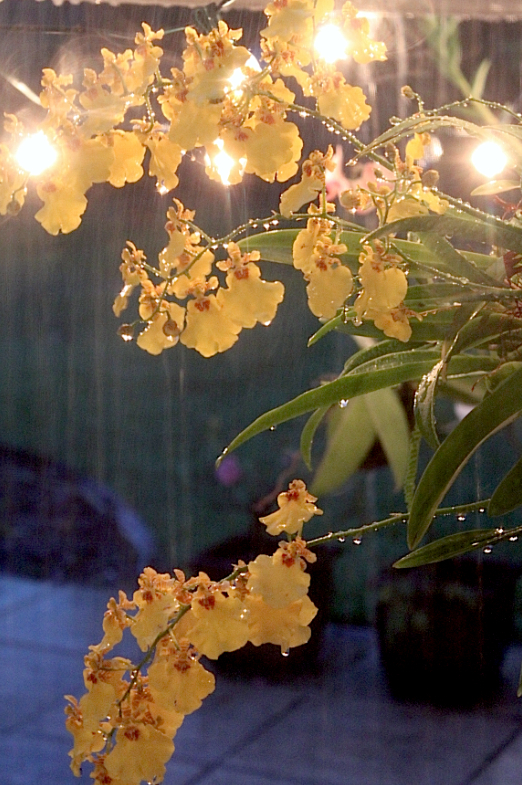 Those yellow orchids with the raindrops and beads of water are breathtaking! I'm so glad you captured such a magical moment! A lovely post to read AND see. Thanks for stopping by Be Book Bound. It is nice to meet you! I love the picture with the blue ladder and the bike with flowers. I feel like I could just sit in that spot and be meditative and inspired. Beautiful. Beautiful photography. I love the rain pictures. The rain did make for some unique photos! Also love your aqua door rescue...as soon as I saw them, I fell in love! It's funny, because last night I sat there on Pinterest setting all of my board covers to aqua/white/pink...so when I saw them I fell in love. Thanks for visiting my site. I am off for the summer, so I will be posting much more often :) Come back and visit! hi friend, we had a week of rain aqui.acho by now she was to his city, risos.bom domingo.valéria. (Brazil). understanding Ah.estou saw your translation? I LOVE YOUR POST WITH THOSE BEAUTIFUL PICTURES!!!!!! 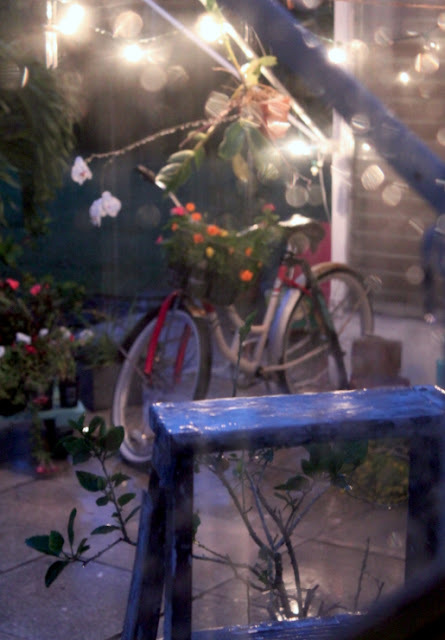 I love rain on windows and I LOVE LOVE LOVE those flowers in the bike basket! Beautiful! In Belgium they have these great satchel-style bags for the back rack on the bike and these are usually filled with fresh market goodies- so romantic! I was thinking that as well as a pick-up truck, you might find a radio-flyer type wagon useful too for picking up your local treasures! Glad your garage sale went well! Your rainy photos really do look at watercolor. You must be an optimist and you were rewarded by a rain free yard sale (maybe not rewarded monetarily though!). Thanks for visiting my blog. 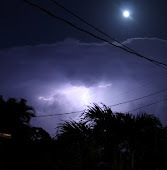 We are experiencing TS Debby right now and I don't think our rain will ever stop! I love the photos of the yellow orchids wet with raindrops! 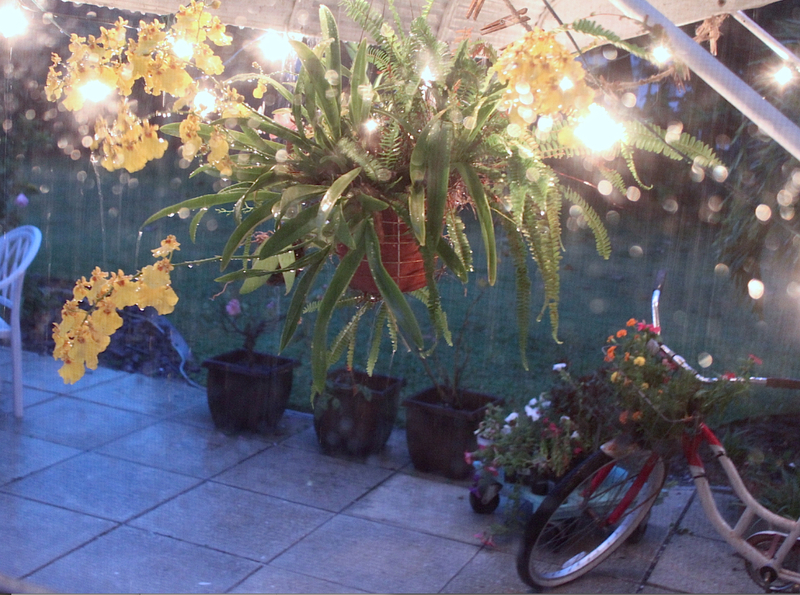 The lights reflecting off the wet flowers are amazing. That would be a good one to frame. I am a new follower. Thanks for stopping by True Aim. I hope to see you again soon. 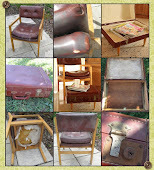 I have visited here before but you were on my blog and said to visit so I am here again :) I LOVED this story and the photographs! For five days here we've a 'possible showers or storms' in the forecast but no rain. Wow, the first pic with the window seat is so... French! (I mean that in a very good, moody way, like something from Deviant Art). And the close-ups with the rain drops on the window are great, I'm pinning this. And I'm also following back with all my heart :) Cheers! Gorgeous pictures! Wish I had some of your rain! 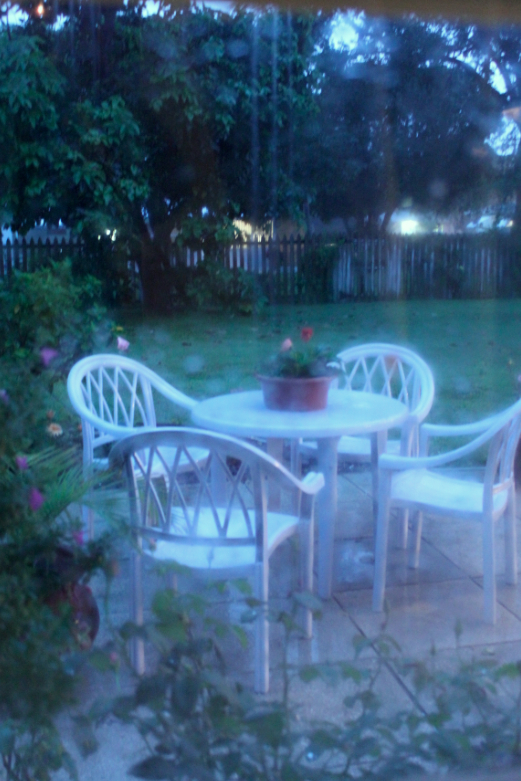 The rain is nice, and better than no rain at all, like we had last summer. Lovely photos too. We're about 30 miles NW of Orlando and it's rained everyday for what seems like a month. The soft, gentle rain is lovely - those heavy winds, especially at night, aren't so enjoyable! Love your photos through the window looking out over the patio. Oh, I just love those photos that look like a watercolor painting. How clever of you to switch the focus to create that effect. I love it! Sheer poetry - love your way with words and your photos are exquisite thru the rain dropped (and paint splattered) windows. Here's to $60 and doughnuts - what could be better! These are such interesting photos of you playing with the rain! I've got to give that a try if we ever get any rain this summer? 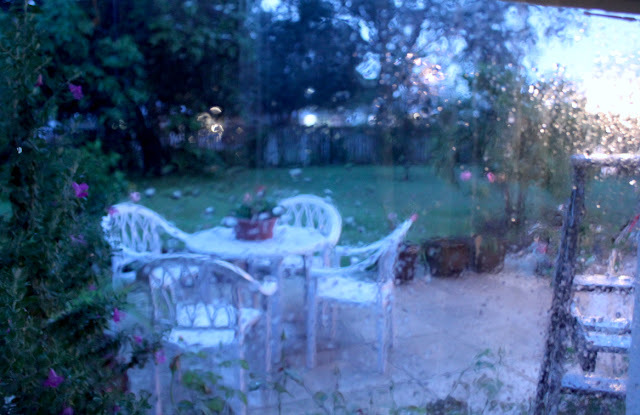 I love that ethereal quality that the rain gives the pictures, magical! Glad your garage sale wasn't ruined. Thanks so much for stopping by and leaving such kind words. Your dahlias and orchids are breathtaking! 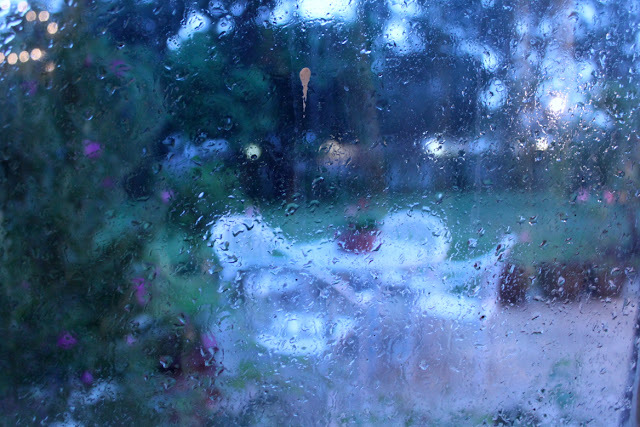 The pictures of your garden and the rain splattered window are beautiful! Beautiful pictures. You did a great job. 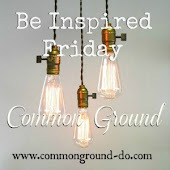 Your photos are extraordinary and your outlook to enjoy the rain rather than be glum was so encouraging. Happy that the weather cleared and you had your garage sale. 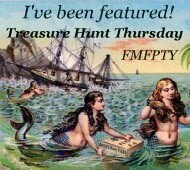 I so enjoy your posts shared on Think on These Things! Your photos were amazing! 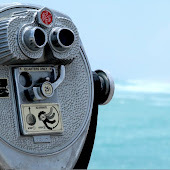 I love the way you changed the focus and thereby changed the whole feel of the picture! Thank you for linking it to The "Sunday Stop" and sharing that with us!